All the latest news from Motor Answering and the automotive industry. 1. Do you know what you’re looking for? Make sure you have done your research before you go to the dealership. Ring ahead and book an appointment or enquire as to when the dealership is quiet to ensure you have the full attention of the salesperson. Have as much information with you as possible, a new model of the car you’re after could be releasing a new model soon meaning you could push for more money off or wait until the new model is released. 2. Is it the correct time? Sales targets for dealerships are usually at the end of the month, going around this time means that you will get a better deal around then. Also dependent on the time of year, if you are wanting to buy a convertible the best time to buy one is in the winter as dealerships are wanting to sell the cars to make way for new models. Stand your ground. Be sure you give off the right vibe to the salesperson, not to keen but not too cool. Let them know you want a car for a good deal. Dont let them know how much you are willing to spend. You never want to spend the maximum budget you have, play your cards close to your chest and you’ll get a better deal. Visit a few dealerships for the best deal, shopping about means that you can compare prices and be sure that you have found the best deal. Being able to tell other dealerships what you have been quoted elsewhere means that they may want to beat it. Dont let your trade car go for less than its worth. If your going to buy a new car you need to make sure that you get the best deal on both your old and new purchase. Get more than the car. Getting a good deal is one thing however getting free car mats is another. If you don’t ask you will not receive. See what they can throw in for free, even if its just an extra air freshener at least you car will be fresher for longer. If you think you can’t afford the car you can always consider finance. The dealership will usually help you with this, or you can go to your bank or high street loan companies. Don’t feel pressure to buy the car if you don’t think you need it. if its not for you, walk away. Don’t buy the car just because its cheap. Safety, resistance and reliability are factors you may need to invest in. Buying a reliable car will benefit you in the future instead of saving you money on that particular purchase. When enquiring or buying online, customers can be put off by the need to register as they feel like they are asked too many questions. It was revealed through a survey conducted by digital payment expert Skrill, that 38% of people would not complete the process if a website asked for registration before being able to progress to the site. This is not aimed at the motoring market however the research does mean that dealerships will need to review the strategy on their website and ensure that they are not driving customers away. The first point of interaction between a dealership and a customer will usually be the website, so it needs to be customer friendly. Further research from the survey showed that if a website was too slow or crashed, 43% of people left the site. 25 % of people would leave a website if they felt like it was not safe or secure. 32% did not like being asked too much information and a further 14% said that they left it all together if they realised that the website was not UK based. Taking these into consideration it is essential for dealerships to ensure that their website is updated regularly and is a welcoming environment for browsers and customers. Would you buy a car in a dealership without speaking to a salesperson? 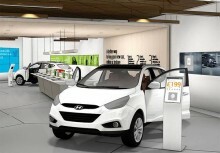 Hyundai believe that customers would, as they plan to open a store where you can buy a car without consulting a sales person. However if you feel like you would prefer to speak to a member of staff ‘Rockar Angels’ will be there to help with any queries. Hyundai and Rockar have partnered for the launch and they hope that this method of shopping for a car will offer more flexibility and convenience to fit with customers busy lifestyles. The concept was developed after research showed customers make 1.3 visits to a dealership before purchasing a car. A further 93% of all new car buyers conduct their research online and the only time they enter a dealership is to sign for and collect the car. Rockar Hyundai will open their first store in Bluewater shopping centre in Kent. This concept shows how important the enquiry process of the car purchasing process is, and when customers want to know information they will call to enquire. Do you think this concept will be successful?